People ask me all the time, what do you buy? I have my favorite categories but I will honestly buy whatever appeals to me and what I can resell for a higher price. From 19th century English porcelain to a 1978 Hardy Boys board game. We find all categories of vintage and antiques fascinating from some point of view. It wasn't until we moved to Chicago that we looked at art via estate sales. It didn't take long to see how many great Chicago artists there are. Some famous, some never famous and some in between. We took on a new appreciation for real art. The kind painted on a canvas or drawn on paper. Not Monet's Water Lilies posters from the 80's or Ansel Adams posters, real paint. I had been called on a collection of vintage and antique jewelry (#1 favorite category) and and few weeks later was invited to look at other items. When i saw this vintage, small but mighty oil painting, I was smitten. About 4 inches by 6 inches, a blue bird looking through a pair of binoculars. 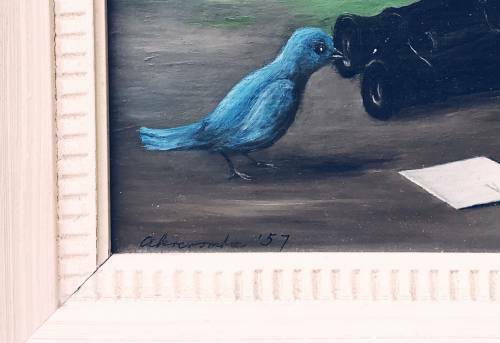 Signed Abercrombie, 52. I went home and did some research. Gertrude Abercrombie. 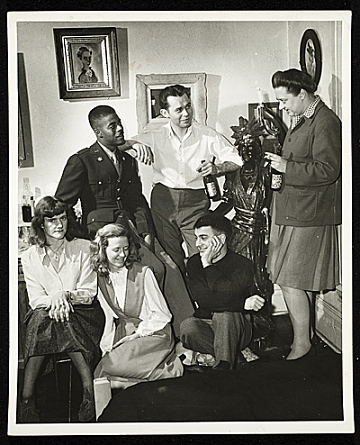 (1909-1977) A Chicago artist with little formal training. A brief time at the School of the Art Institute of Chicago. She lived in Hyde Park and loved the Bohemian lifestyle of the time. She was known on the Chicago Jazz scene. Dizzy Gillespie played one of her weddings. She drove herself around in a beat up Rolls Royce. Gertrude came from an artistic background. Both of her parents were talented opera singers. The family moved to Germany to further her Mother's career but the unfortunate outbreak of WW1 forced their return to the US and they settled in Illinois. Self-portraits were frequent and she considered herself ugly. At the Art Institute of Chicago, the painting "Self-Portrait of my Sister" is intriguing as she never had a sister. It was how she saw herself or pretended to be someone else. Her features were pointy and witch like and often capitalized on the look for her own amusement. The 40's and 50's were arguably her best in terms of work. Still life, simple objects and a bit of surrealism. One of the first women to go into that genre. 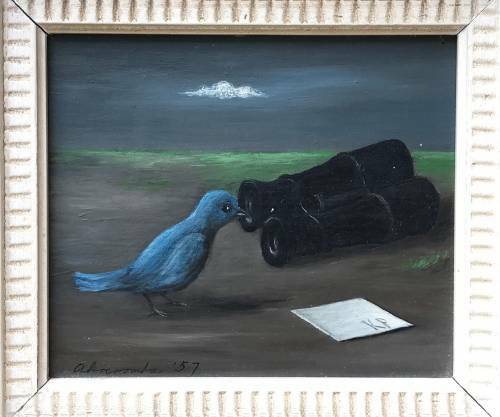 My painting, a blue bird looking through a giant pair of binoculars struck me. Whimsical, simple but complex. 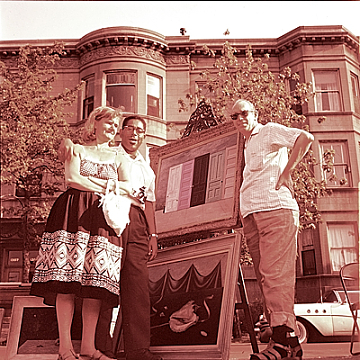 It was exciting to learn the collector I purchased it from, purchased it directly from Gertrude at an art show in the 1950's in Chicago. I will add more about that as soon as I get more info. 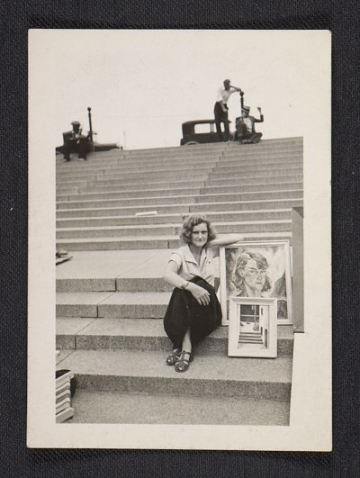 Gertrude belonged to the Chicago Society of Artists and was employed as a WPA artist adding validation to her as an artist. She became reclusive in the late 1960's and alcoholism and arthritis were front and center. She died in 1977. 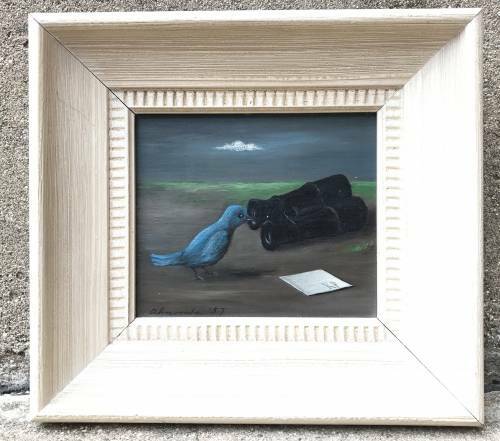 Currently my Gertrude Abercrombie collection consists of one piece. I'd love to add to that. I've looked at a few pieces so far but so far another hasn't panned out. Please contact me if you have a piece or pieces. I'd love to see!